Life-changing hurricanes, devastating tsunamis, and last-minute tornadoes are just a few recent havoc's that Mother Nature has wreaked upon us. But with "Super Storms that Rocked the World" by Meredith Books, you'll get to take a glance into the devastation of nature before the era of technology. Explore shocking disasters from the past century and the last few years that ravaged nature as we know it today. How many of you out there love storms? I know I do. I think this book is perfect for storm lovers. This book teaches you how storms happen, why, and how they can wreck the outdoors. This book has a lot of facts about storms. A lot of storms wreck things, but some do not. Have you ever seen a lightning storm? If so that is one that does not usually make destruction. It is a cloud full of lightning. 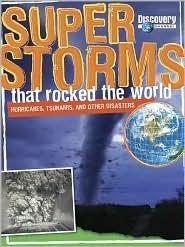 If you like storms, read, borrow, check-out, or even buy this book.